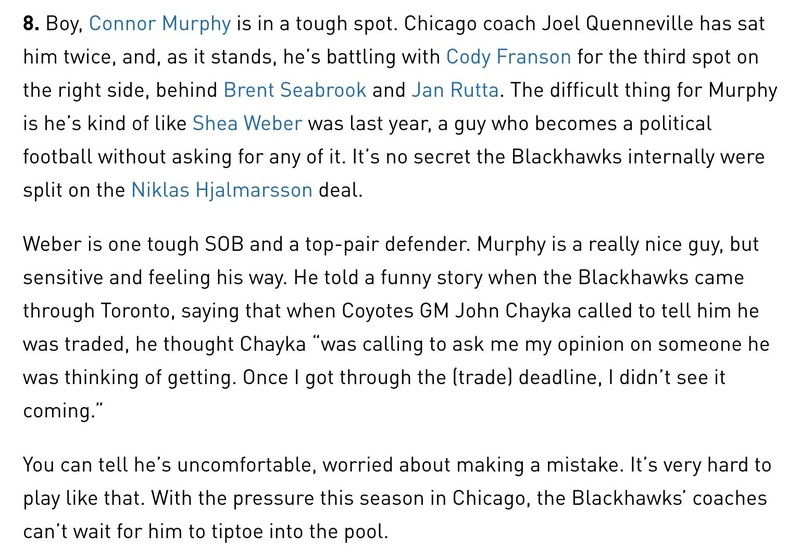 Elliotte Friedman of SportsNet posted his 31 Thoughts column this morning, and had some interesting comments on Blackhawks defenseman Connor Murphy. 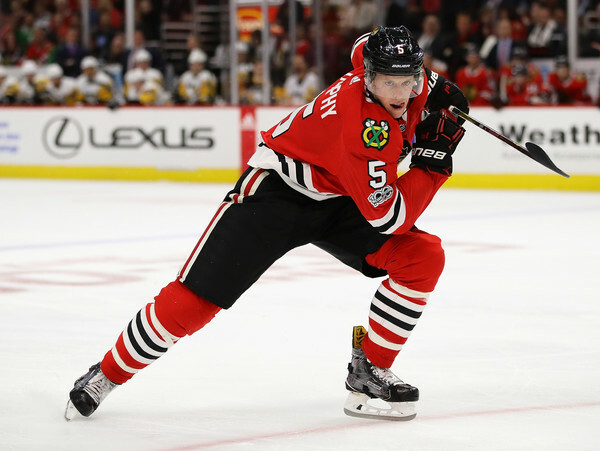 Murphy was on the third pair with Michal Kempny at the Blackhawks’ morning skate on Wednesday and is expected to be back in the lineup against St. Louis. Seabrook is the one who should be feeling pressure, based on the number of awful mistakes he has made. Murphy looks to be needing to regain his confidence unfortunately Rockford is not a solution. Hopefully he gets it together and forces his spot in the lineup. Think of how much better the Hawks would be right now with Hammer instead of Murphy. I know that trade was about futures, but in my book we moved Hammer one year too early. He has two years left on his deal, not one. At some point, Murphy’s play has to start to equal that of Hammer’s, maybe it will in a couple of years, but we’ll see. Chicago is not a great place to find your feet as you try to fit in. It is Stanley Cup or bust. Just ask Trevor Daley. And that’s not on the coaches, either. Our success has bred that environment and it starts with the CEO on down, the expectation of competing for the Cup each year. The pressure doesn’t appear to be affecting Rutta so Murphy better get acclimated soon. It’s not like he’s been terrible. Majority of his starts have been in the D zone. The problem for Murphy is Rutta. Rutta was almost a surprise to make the roster. They almost guaranteed Franson ice. Youre not going to bench a guy with a letter. Who hasn’t been dreadful despite everyone saying he is. Franson is slower than 7, yet because of salary (that we don’t pay) nobody cares. And they’re not going to bench Rutta who you could argue had been the best d man. The Hawks may have 99 problems, but Seabrook ain’t one of them. After next season the CBA can be renegotiated, which it most likely will. Only after that will we know what tools team have for dealing with contracts that will go on too long or lose value. Seabrook will be fine this year and next for what he is paid and how he performs. Everyone crying wolf over the last four years of his deal should relax, and focus more on what would help this team win a Cup this year or next. With Rutta an UFA after this season he is probably going to get a deal if maintains his level of play somewhere close to 4m/year. With Murphy at 3.85m it would be doubtful unless one of them becomes leftside point man that they would pay a 2nd and 3rd pair rightside that much next year. So likely only room for one for the long haul anyways if Murphy traded. Hopefully he ends up just relaxing and plays his game. One shift at a time. Good or bad just get back at it. Everyone has a right to their opinion, but the sample size for Murphy in a Hawks uniform is way to small to judge the guy imo. What are we two weeks into the season and he has sat for a few games. From what I have seen, he has looked ok and wasn’t making huge mental errors when he played. As the season progresses and we get into late Dec and January a more reasonable assessment can be made. I like the D pairings they appear to be skating tonight. Really should have kept Hjalmarsson for another year then sort out salary cap! Strong “D” is what Gawks need desperately and the aging core is gonna feel the pinch… interesting comment on Crawford ?! Darling was great! I think you let coach “Q” figure this out for a month or 2 then let him help Stan make the right decision ? such high hockey IQ would be wasted if we don’t let the brains do their job!! 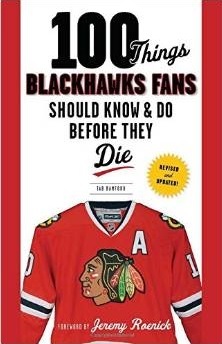 To All: Please let’s close the book on the Seabrook discussion, alternate captain, steady as a rock for over a decade, clutch playoff performer, one of the handful of guys who brought it last playoffs versus Nashville. As for the defensemen roulette (sans Keith as well), why does Forsling get a pass, constantly? Murphy scratched, now Kempny scratched. Forsling is lucky he is on the team (let’s not re-hash his potential, etc…). If Murphy and Kempny are getting scratched, Forsling needs to watch some games as well. His play so far is closer to Greg Fox than Bobby Orr. Murphy deserves a chance. Something that he is also dealing with is playing on a very good team. He didn’t experience that with the Coyotes. Great to say let’s ignore the realities of team dynamics! Ever coached? Managed? Felt the pressure of change requirements? Don’t dismiss by replaying history – good luck rationalizing that!! Face the reality that change has to happen- not for the sake of change but for the need to improve to succeed!! Get a grip Ice-Man!! this isn’t a TV reality show, Dancing with the stars or Bachelor! It’s real time sports ? Hjarlmasson should have started the season in Chicago. I believe Joel is not very happy to have lost his most reliable defensive defenceman. And Murphy being benched is the message. Murphy rang one off the post tonight in St. Louis. The kid needs a break to go his way. Nonetheless, Bowman is not going to let Q jerk him around on this. The last two games Nashville and St Louis have been Waaayyy better than the Hawks. Q is not getting a ton out if a salary cap max team might soon become the narrative. Hammer is a -4 with a 43.7% COF so far this year. I liked him as much as any of you guys but don’t be surprised if, at the end of the year, we conclude Bowman sold high. Re: the also tired Hammer regrets, I wish he could have stayed too, but 2 words. Salary. Cap. You can’t keep everyone you want to keep, and you need a willing trading partner to trade. We understand the cap issues but everyone has those issues and the difference between contracts was not high except for the term. It seems Bowman is always at the short end of the stick with salary dumping trades….